Coffee urns are basically large coffee makers for commercial settings. Once your needs get past the 12-15 cup drip coffee makers there isn’t a really good way to make bulk coffee for large groups without getting your hand on a coffee urn. Coffee urns make coffee just like a really large electric percolator. They are stand alone devices that don’t need external heat sources – just a power outlet and they need just as much grind as you need. You don’t have to brew full urns, you can always use less grind and less water to make a half or quarter urn if you want to. Considering this urn sizes have everything to do with how much space you have and and how often you’ll need to brew a full batch. For churches for instance it may make sense to own a full size 100-cup urn (or two) to have enough coffee on hand for an entire congregation. For an office meeting however you may never need a large urn because your office only hosts 10-20 people at max on any given meeting. In the home setting many people find it helpful to own small coffee urns to brew for parties or holiday get-togethers. 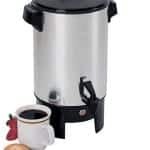 Whatever your needs are we recommend buying a slightly larger coffee urn than you think you’ll need and then just use it to make partial batches as needed. Point being, you never know when you’ll need a bigger batch so you might as well be prepared. Here are our posts dedicated to coffee urns. Please peruse them at your leisure. We are sure you’ll find our commentary and advice helpful. This page is all about the smallest coffee urns. Sizes are limited to 20-cup, 30-cup, and 40-cup models. These coffee urns are typically used in homes and in small business settings. We also find they are great for people hosting small meetings. Most every coffee urn is insulated to some degree but some are cool to the touch while others are much hotter to the touch than others. If you want to pay a pinch more for a “cool touch” coffee urn then check these options out. Most coffee urns people buy for use at home are between 30-60 cups in size. They are decidedly larger than electric perks or drip coffee makers but take up a lot less space than the biggest coffee urns that are usually purchased for use in commercial settings. These models are the big ones, ranging in size from 60-cups to 100-cups. Many people don’t own a coffee urn but once in a blue moon they are hosting a gathering like a wedding or reunion or business meeting where making bulk coffee is necessary. Rentals are the first thing to come to mind because nobody has to ever buy one. We believe however that there are number of great coffee urns for sale that are comparable in price to many rentals. 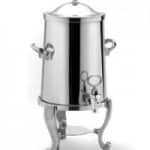 If you are considering renting a coffee urn then check this page out and let us see if we can change your mind. 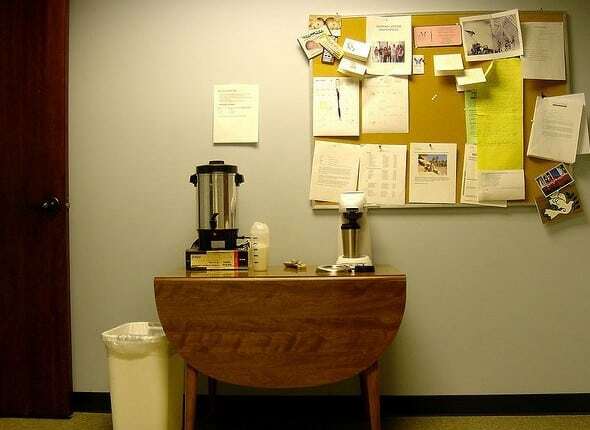 Everyone has seen the classic setup of a coffee urn sitting on top of a half saturated dish rag. That’s never a pretty sight especially when there are so many different drip catchers for coffee urns and dispensers on the market and they cost so little. If youare buying an urn then please consider getting a drip tray as well. No matter where you plan on using your urn the drip tray will make your whole coffee bar seem a lot more polished and sanitary.